The Winter Market in the French Quarter is in full swing, but murder isn’t taking a holiday in this festive mystery in the New York Times bestselling Scrapbooking series. The holidays are a busy time for scrapbook shop owner Carmela Bertrand—but not so hectic that she doesn’t have time to enjoy browsing the booths at the Winter Market with her best friend, Ava. The last thing the ladies expect to see is a lurching man stabbed by a serving fork, dying in front of them. The victim is loathed restaurant critic Martin Lash, who posted his scathing reviews on the Glutton for Punishment website. And the prime suspect is New Orleans restaurateur Quigg Brevard—who was seen giving the critic a tongue-lashing minutes before someone stuck a fork in him. An old flame of Carmela’s, Quigg asks for her help, which does not please her current beau, Detective Edgar Babcock, to say the least. 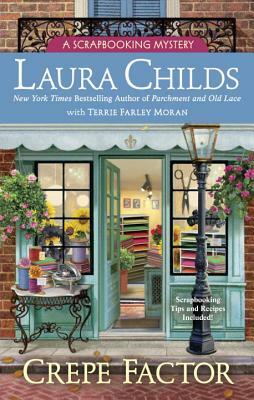 Laura Childs is the New York Times bestselling author of the Tea Shop Mysteries, the Scrapbooking Mysteries, and the Cackleberry Club Mysteries. In her previous life she was CEO of her own marketing firm, authored several screenplays, and produced a reality TV show. She is married to Dr. Bob, a professor of Chinese art history, enjoys travel, and has two Shar-Peis.